Though vaping devices don’t contain tobacco, they still have nicotine, a highly addictive substance. On the heels of another damning statistic against tobacco — it kills more than 7 million people each year, the World Health Organization said recently — come questions about whether vaping is a healthier substitute. The idea that they could be stems from the fact that e-cigarettes and other vaping devices can supply nicotine without tobacco or other additives and byproducts, like smoke, that are in a traditional cigarette. A 2014 survey of 19,000 e-cigarette users found that 88 percent believed e-cigarettes were at least safer than regular cigarettes and 11 percent believed e-cigarettes were harmless. More recently, a report published by the U.S. Centers for Disease Control and Prevention found that only 22 percent of adults believed secondhand vape aerosol caused “a lot of harm” to children. The public, it seems, has warmed up to vaping, but that doesn’t mean the practice is safe, say two UCLA doctors. Vaping entails using a device that heats liquid and nicotine (or another substance) so the user can inhale the byproduct. Vaping devices come in the form of e-cigarettes, vape pens, and even electronic hookahs. They typically generate a plume of vapor that mimics smoke. Such testing is still in progress, but many local governments are already moving to treat vaping like tobacco cigarette smoking. California’s passage of Proposition 56 means e-cigarettes and vaping products will be taxed in the same way as cigarettes and other tobacco products. The state also prohibits vaping in those areas where smoking is prohibited. 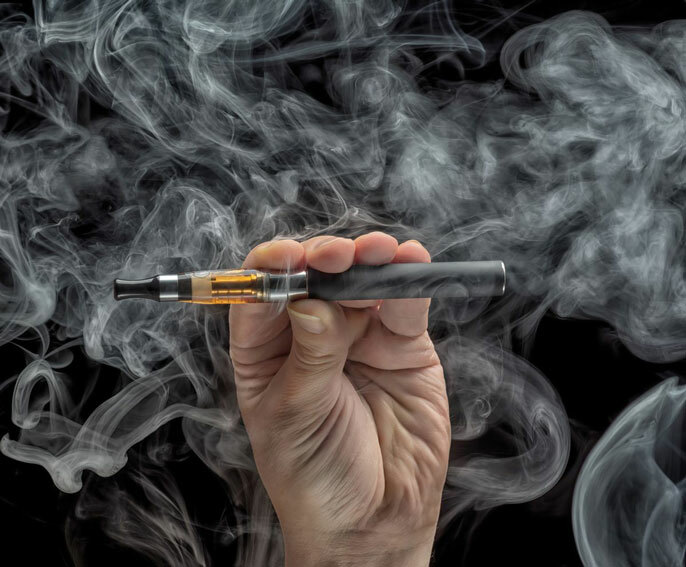 Though vaping devices don’t contain tobacco, most still have nicotine, a highly addictive substance that has many potential effects on the body. “We’re first and foremost concerned about nicotine’s effect on brain development in young adults, since the brain is still forming even into ages when we might call people ‘mature,’” Ong said. In a 2011 study led by Edythe London, professor of psychiatry at the Semel Institute for Neuroscience and Human Behavior at UCLA, researchers found a strong association between adolescents’ addiction to nicotine and lower levels of activity in the prefrontal cortex. At very high levels, nicotine is toxic and can be lethal. This underscores the importance of avoiding an unregulated environment for vaping, Ong said. Middlekauff finds the marketing of vapes to young people especially concerning. Substances used to create the signature smoke effect in vapes can also carry risk. Glycerine and propylene glycol, for example, can create carcinogens. To minimize harm, consumers need to understand how such substances are being used, Ong said. While the cardiovascular risks of cigarettes are well-documented, researchers are continuing to study the risks of vaping devices. Middlekauff co-authored a recent study finding that habitual users of e-cigarettes were more likely than non-users to have signs of oxidative stress and higher levels of adrenaline in the heart — two prominent heart disease risk factors. Her team is currently comparing the effects of tobacco cigarette use and e-cigarette use on the heart. Social acceptance of e-cigarettes, some experts say, could re-normalize the use of regular cigarettes — especially among adolescents. According to the National Institute on Drug Abuse, 31 percent of vaping device users started smoking within six months, compared to 8 percent of non-users. Recent data shows that youth are no strangers to vaping. According to a CDC report based on data from 2016, more than 10 percent of high school students reported using e-cigarettes. The good news: the CDC recorded a drop in e-cigarette use among high school students compared to the year prior. From a public health perspective, Ong suggested it is better to be cautious in rolling vaping products out and regulating their use rather than dialing back on them once consumers have all the data. E-cigarettes: Does smokeless mean harmless?